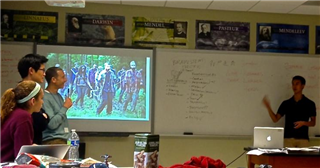 Last week, students in AP Biology and AP Literature joined forces to bring new life to the subject of the undead. Biology students recently completed a unit on viruses, while literature students have been examining the graphic novel genre (specifically, the Walking Dead graphic novel series). Dr. Burckin and Dr. Rosenwong took full advantage of the integration potential of the two units, team-teaching one another's classes before bringing all students together for a joint class. Together, the group laid out the ground rules for the Walking Dead universe, and discussed the rules of biology in relation to popular zombie tropes including reanimation, metabolic reactions, evolution, lack of reproduction and response to stimuli. AP Literature students can incorporate formal science into essays they will write on the topic.